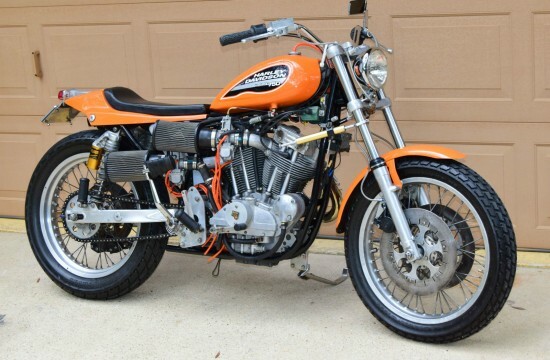 We don’t normally get to feature Harley Davidsons on this site because The Motor Company really didn’t make many bikes you would normally categorize as “sport bikes,” and the ones they did build are extremely rare. 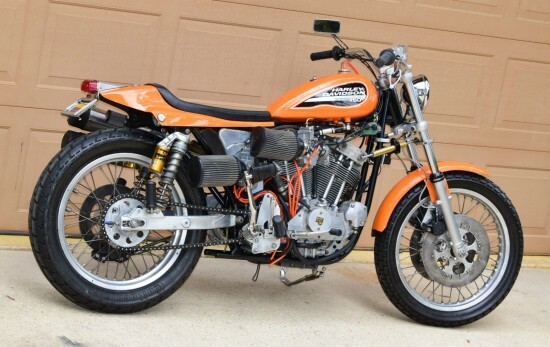 Although the Harley Davidson XR750 was originally intended as a flat-track racer, today’s example has been reborn with roadgoing equipment and I’ve decided it qualifies, since it’s supposedly powered by an ex-racing engine and I bet it could would eat most of its roadgoing rivals from Triumph or Norton for lunch. The race-ready XR750 is considered one of the most successful racing motorcycles ever, winning 29 of 37 AMA Grand National Titles between 1972 and 2008. Yeah, you read that correctly: the XR750 was competitive in flat-track racing for over 30 years. 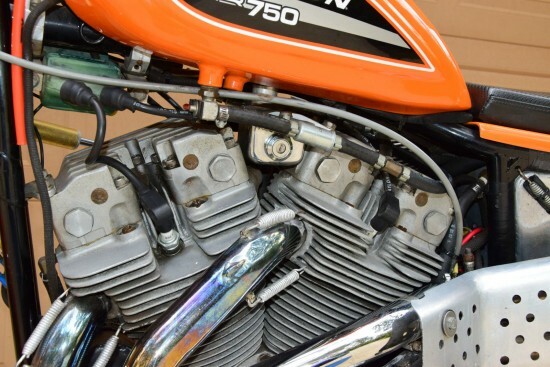 It was powered by a 748cc pushrod v-twin with aluminum heads from 1972 on that improved cooling, compared to the earlier iron heads. Certainly that engine featured primitive architecture, and yeah, it was only competitive considering the specific ruleset that governs flat-track racing. But let’s be real here: all racing is governed by rules that artificially limit development to help keep performance of competing machines somewhat comparable, so that in no way diminishes that impressive record of wins. Surprisingly well preserved Harley XR750 flat track bike with 1972 engine. Street legal in most states, and WITH TITLE! MATCHING NUMBERS on both engine and frame! This particular bike’s engine is reported to have been ridden in 1972-73 by Cal Rayborn, Mert Lawwill and Scott Brelsford. Harley racing royalty then and now. 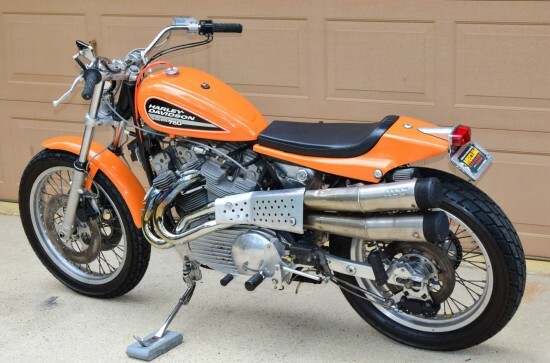 Of all years of HARLEY XR750, 1972 is probably the hardest to find, since they were very popular, in short supply, and were either used up or supplanted by later year engines with more power. This bike does not have an odometer or a speedometer, so I have no ideas how many miles it has run. What kind of flat tracker has dual front brakes? Or any front brakes, for that matter?! 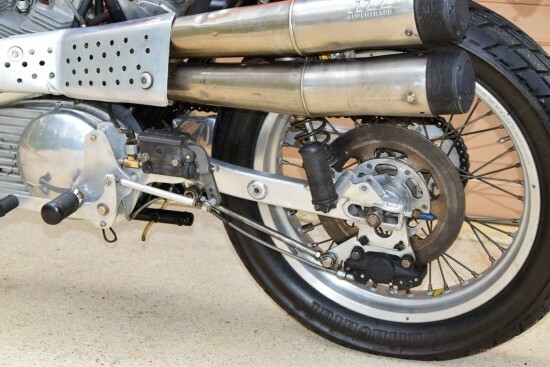 Well whatever the engine and frame’s original provenance, they’re part of a bike with roadgoing intent now, and the stopping power afforded by those dual calipers will be much appreciated, considering the potential speed on tap. The Buy It Now price is listed as $29,495.00 with very little time left on the auction. That’s a great deal of money for a motorcycle, but considering that XR750’s don’t usually offer you the opportunity to terrorize your neighborhood, it’s really like you’re getting two bikes in one! Having ridden a street-ified XR750, I can offer some insight: you’ll find the motor incredibly smooth with a turbine-like power delivery, which only builds powerful like a fast train as it revs. Not modern superbike power, but for the street its really fun. The steering angle is a bit sharp for street use, and they can be a little squirelly at over 80mph, but this can be fixed with different triple clamps, which I presume this owner had done, given the front end. BIg fun, very charismatic. Also these special frames and XR-750 engines are not built to withstand many miles when ridden on pavement. If you must have a Harley XR-750 looking street tracker and plan to ride any measurable distance on the street, buy a ’83-84 XR-1000 and modify the body work to look like a XR-750. Have a ’77 in a custom CJ monoshock frame converted for the street. Hooligan doesn’t begin to describe!! :)) Huge fun on the street and no major nasty habits as suggested above (although it isn’t my favorite freeway touring ride). Nothing like a British or Japanese twin. No significant maintenance issues so far (four years going) but I honestly don’t ride it that much – you need to be FULLY AWAKE and ready when you ride it! Quite few bikes come in and go out of my garage, but few are keepers. The XR is a keeper! Can’t speak for this particular bike, but if it is half as much fun as mine, you won’t be disappointed! The B.I.N. price is a steal for this bike! I’m surprised it went unsold. Paul [and others] thanks for chiming in! Surprised to hear that the 45-degree twin is that smooth but, assuming it’s really an ex-race engine, it’s probably been balanced and lightened extensively.